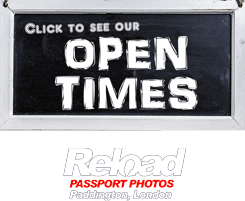 Reload Internet is a passport photo studio that specializes in Latvian passport and visa photographs. We can capture, print and prepare your Latvian passport photo or visa photo so that it is ready for your application instantly. You don’t need an appointment with us; just stop by our store and one of our photographers will take and print your Latvian passport photo or visa photo in less than 10 minutes. We are located in Paddington, London, only a 30 second walk from both Paddington train station and Paddington tube station, making us extremely accessible for people in every area of London. 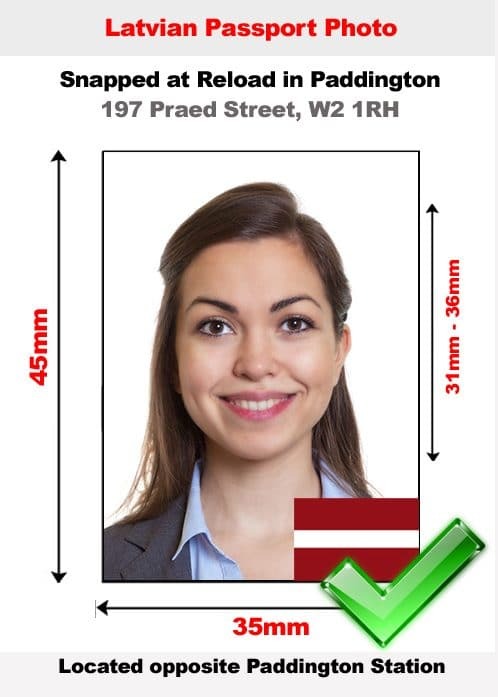 We will capture your Latvian passport photo or visa photo with the correct background and lighting requested in the official guidelines released by the Latvian Embassy, and will then check the photograph to ensure it will pass first time when you submit it with your application. Only after guaranteeing that your Latvian passport photo or visa photo will be accepted, will we print it using the latest digital passport photo printers and cut them to the exact sizing stated by the Embassy of Latvia. We will provide you with a set of 6 Latvian passport or visa photos, all for a price of just £9.99! Our extremely successful service cannot be beaten! You should make sure that your Latvian passport photo or visa photo meets the requirements listed below, if not your application will probably be rejected by the Latvian Embassy. Come to Reload Internet to ensure that this does not happen to you! You should submit one photo with the dimensions being 35 mm X 45mm, clicked against a white background. With a distance of 30 mm to 34 mm between your chin and crown of forehead, the photo should clearly show your facial features and you must sit in a straight and upright position when the photo is being clicked. If you have long hair, make sure that the hairstyle does not cover your face and the hairstyle should be clearly seen in the photograph. When you are applying for a Latvian Visa, you will have to ensure that the photo is not older than six months. You should look similar in the photo to how you look now. The photo should be clicked when you are looking straight into the camera. The photo should show your head square to the camera and there should not be any type of tilt in the angle of your face. Your face must be directed towards the camera and your eyes will have to look into the lens of the camera. Do not try to retouch or edit the clicked photo to soften or hide any feature. All the features in your face including black spots must be seen clearly in the photo. The color tone of the photo must be original and should not be changed. Print the photos on a high quality photo paper with a resolution more than 600 dpi to ensure that it is clear. If you wear glasses, take it off while clicking the photo. Even if you wear glasses, there should not be any glare and the frame must not obstruct your eyes in any way. When you wear specs, the shadow, reflection or glare should not appear in the photo. There are chances of rejection by Latvian authorities if you wear glasses, as there are high chances of a glare in the photo. The face must be visible clearly in the photo and the glasses should not cause obstruction of any manner. Head wear is not allowed for the photo, apart from religious reasons. Under such circumstances, you will have to ensure that the forehead to chin is clearly visible in the photograph. In case of infants, you should click the photo when they are seated and if they are not able to sit, support them to sit and the support must not be visible. Your Latvian passport photo or visa photo should meet all of the necessary requirements listed above, as if it does not then your application will most likely be rejected when you go to submit it to the Latvian Embassy. At Reload Internet we guarantee to produce your Latvian passport photo or visa photo correctly the first time, so that you don’t encounter any unnecessary delays due to photo errors. Our specifications are taken from the Latvian Embassy’s guidelines on passport and visa photographs, available here.